Goal of the design was an ultra compact, robust, and completely fanless Embedded Computer. Based on the low power, embedded, long-term available Intel Atom Z530P processor, we designed a system, that works smooth between -40°C and +75°C without derating, throttling, fan, or case openings. Integrated are features like up to 4 Gbit Ethernet ports, 7 USB ports, and 2 serial ports. DDR2 memory modules up to 2GB can be used. The unique design allows the system to be used in any application, regardless how rugged the environment might be. 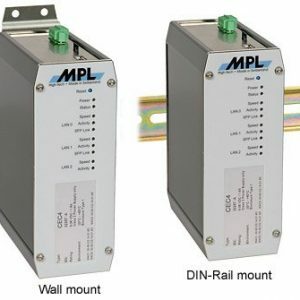 MPL computers are available according your configuration, even with your color, logo, and labeling. Further, the concept allows customer specific adjustment to achieve the best solution according your needs. Please talk to us about your project requirements! 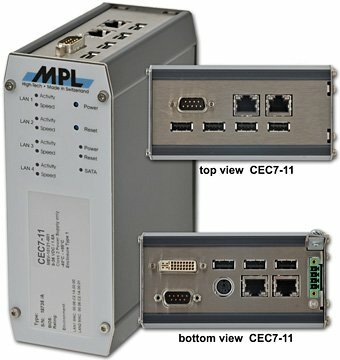 CEC7 systems are 100% PC/AT compatible, therefore any PC operating system (Windows, LINUX,..) can be used. Graphics, 2x Gigabit Ethernet, 3x USB2.0, 2x PS/2, 1x SERIF port (all interfaces on bottom side). Graphics, 4x Gigabit Ethernet, 7x USB2.0, 2x PS/2, 2x SERIF ports (interfaces on top and bottom side). customer specific version according your needs. Please talk to us about your project requirements! For deployment in harsh environments, the CEC7 can be ordered in an extended temperature version. Every system needs to pass various tests in a environmental chamber to prove that it will perform flawless over the temperature range indicated. Please note: In order to get a system that will operate under these conditions, all additional selected components like hard disks or extension cards have to be specified or tested for conformity to the extended temperature range.